Known more cricket than cuisine, the Gabba has quietly established itself as a foodie hot spot in between sirens. From gastropubs to cocktail lounges, from orecchiette to edible ants (what the fork? ), there’s something for everything in the south. Dishing up gastro pub good vibes, Electric Avenue is one venue you’re going to want to rock on down to. Load up on Korean BBQ chicken wings and kimchi loaded fries, or pig out on pork loin. Team your feast with a Voodoo Child cocktail, dark rum, dry vermouth juice and spiced syrup. Bewitching! With daily specials, you’re going to find it difficult not to swing by every day. While this gorgeous laneway may be the next best thing after the Garden of Eden, you’d be out of your tree if you think their foodie repertoire extends to just apples. With four insanely good eateries, your day is set from morning until night with coffee and brekkie from Day Made Supreme, acai bowls and smoothies from Kiss the Berry and Japanese bites from Superfly Funk Eye. Don’t think we’ve forgotten dessert – 31 Degrees has your chocolate dreams sorted in one store. All that feasting calls for a digestive, and we rate whisky over peppermint tea any day. Pass through the wardrobe and into whisky Narnia, Jack Rabbits. With a whisky selection guaranteed to put hare on your chest – Jack Rabbits boasts imports from such exotic, distant lands as Japan, France, Canada and… New Zealand. Looking to take bae on a cute date or gossip over share plates and cocktails? We’ve got just the place to wind down after work or get the party started on a Saturday night. Just across the road from Electric Avenue is sister venue Canvas – the older, more chilled out sibling. The bar lives and breathes cocktails, and it would be sacrilege to visit without sampling two…or twelve. Play Devil’s Advocate with the Pampero Blanco rum cocktail, infused with Apple & 666 Butter Vodka – or go full GOT with Mother of Dragons – a summery spritz. Need your morning java to get you through the daily grind? We feel you, hook us up to that sweet caffeine with an IV drip. Not your average, watery cup of Blend 43, Grinders aims to give the ultimate coffee experience, with espresso based coffee as well as hand-poured V60 on offer. Grab a sweet treat and sign up for a cupping class, Monday just got a whole lot more bearable. Do you want ants? THIS IS HOW YOU GET ANTS! And we LOVE THEM. It might seem alarming at first to have creepy crawlies mingling with your meal – but believe us, order the gunpowder salmon with, green curry foam and yes, citrus-infused ants from Detour. Not convinced? Snap up some of the Kentucky Fried Duck, you’d be quacking mad not to fall in love. 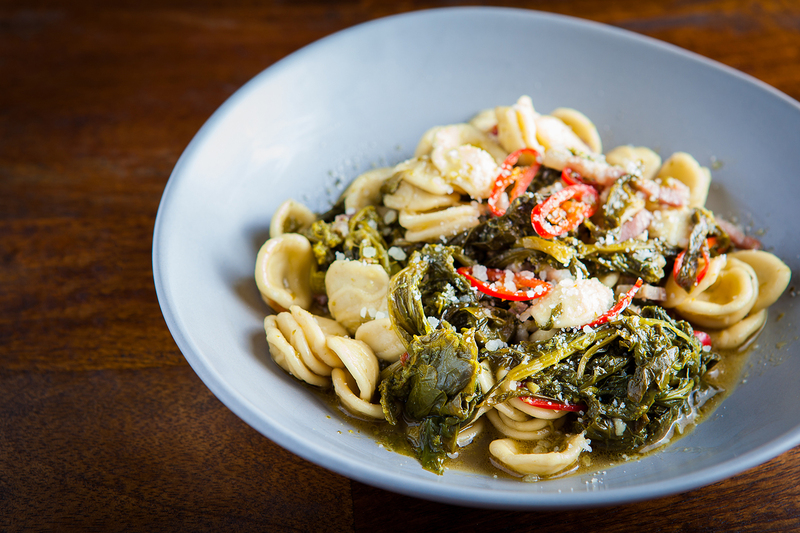 Tucked away down Trafalgar Lane, you can’t get much more authentic than Ristorante La Famiglia Owner Cos (who we secretly hope will adopt us) hails from Italy, and one plate of his orecchiette alle cime de rapa will transport you straight to the old country. Indecisive or just a sugar fiend? You can’t look past the dessert share plate with miniature ricotta cannoli, bomboloni al cioccolato (Italian donuts), panacotta and Nutella brownies. We’ll take 10. We love this place so much we wanted to keep this a secret, but that would be mean because it’s so damn cute! The adorable art deco space bar and vintage shop is filled with retro furniture, shelves groaning under the weight of vintage knick-knacks. With a delicious selection of small batch wines, spirits and craft beers – as a well a killer cocktail list – don’t be surprised if you find yourself stocking up your vintage wardrobe after some libations. Hard to pronounce, easy to love – this cheap, cheeky Indian restaurant is one of our absolute faves. Specialising in veggie food, choose from traditional dishes including tadka dahl, bhaji pav and thali – or get stuck into fresh, fusion options with paneer kolhapuri sandwiches. - the north residing gourmand who is forever jealous of her southside friends.